Are you bored with hearing about how I’m living the high life yet?? Do shout when you are and I’ll write more!! I had a seriously smug moment yesterday when I got a call saying I’d been squeezed into Hix Soho, generally the idea of being squeezed into anything in Soho, brings me out in rather a nervous sweat, but not this time! Hix on Brewer Street is Mark Hix’s latest creation. The ex head chef of The Ivy, J Sheekey and Le Caprise has gone back to his deeply British roots and come up with the imaginatively named HIX. You can’t get a table for love nor money – or so I was told; so I sat at the bar (this is also by reservation only but the I was squeezed in after a cancellation – Phew!) The decor is rather bland with the odd oddity here and there. Above the bar hang various mobiles, the one above us was a collection of small fish, frozen in time in perspex boxes, a little further down from us was a mobile made up of tins of Spam rotating slowly. I didn’t mean to but I ended up testing the poor barman on his menu knowledge by asking a lot of difficult and embarrassingly easy questions (it was almost the end of a very long week). The menu is limited but never-the-less still interesting. 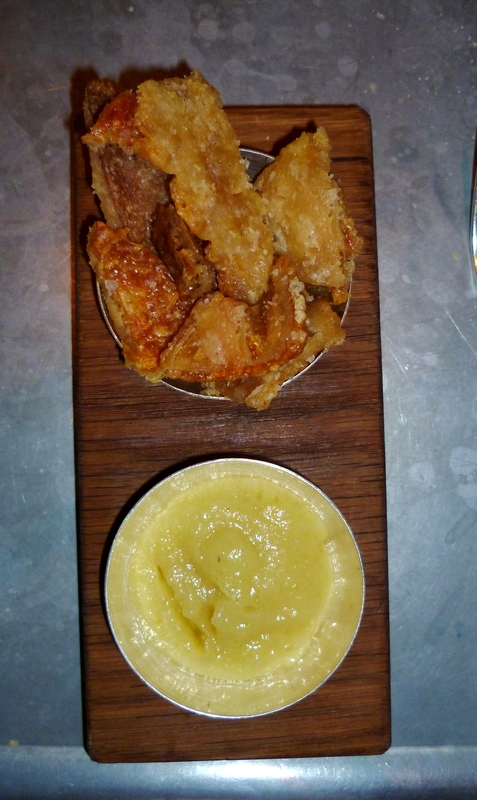 We couldn’t resist trying the crackling with apple sauce as a snack whilst deciding on our starters and mains. The crackling was divine and so wonderfully crunchy. 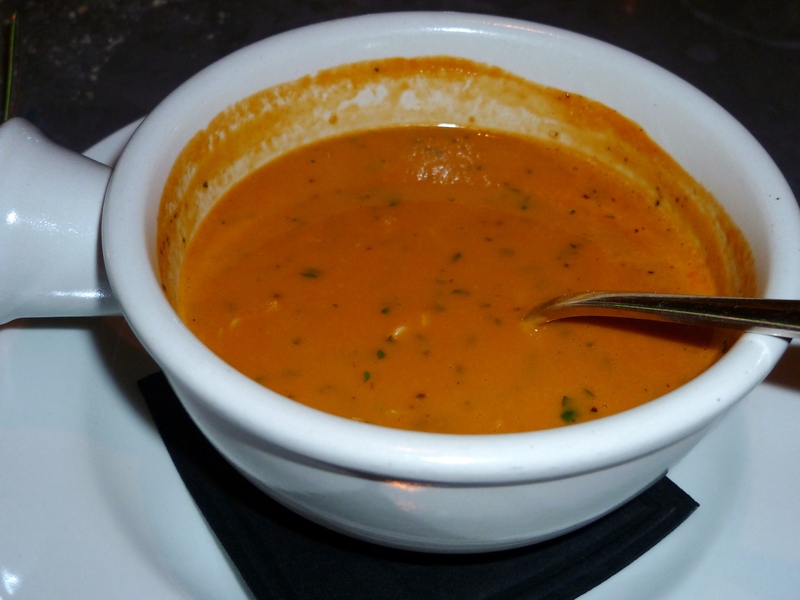 For my starter I went for the ‘Shellfish Soup’, it arrived and only then did I realise that I’d ordered a bisque – which I usually don’t like, but this was great, it’s usually the almost bitter bit of the bisque that puts me off but as it was a full shellfish bisque and not just lobster or crab it was really really good and the hidden bits of prawn and yummy white crab meat that kept landing on my spoon that made it extra special. 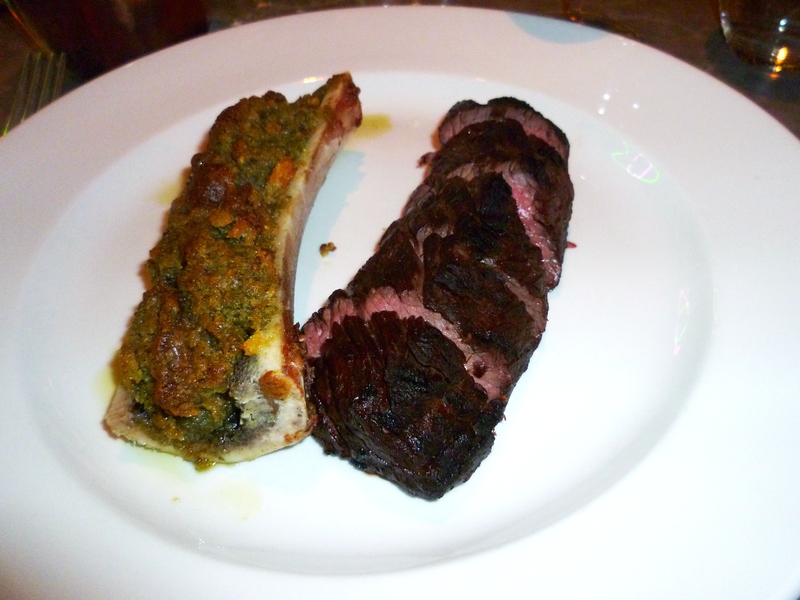 For my main course I went for tha Hanger Steak with Bone Marrow. I’ve never tried bone marrow and everyone is raving about it, so I thought I’d give it a go. Hmmmm, my steak was really rather tough and a just not as tasty as I’d expected it to be, dry and under-seasoned…. And bone marrow – not for me! I can’t claim to be an expert on this as I’ve never had bone marrow, but I’m fairly sure it’s not supposed to taste like fat and olive oil soaked soggy breadcrumbs. There in came another issue, due to the sheer amount of olive oil the whole thing had a faintly green colour. Maybe Olive Oil goes with bone marrow, but I just don’t think I like it…. The burger that my friend had was very good apparently, tasty and well held together. And, if you’re a person of smaller stature (like my good self of course) you can have it with or without the bun. I also like the fact that all the bits are cut in larger slices so that you can pick’em out if you want to. For me, the high point of the main course were the utterly gorgeous, crunchy, fantastic amazing chips with their individual silver dipping bowls. Just yummy! I would definitely go back to Hix, I really don’t think we got the most out of it – the cocktails are true pieces of art. The barmen are obviously passionate about what they do, the downstairs bar is definitely worth a visit with its mini pool table and comfy leather seating. The menu is well thought out with dishes such as ‘Heaven on Earth’ (a black pudding based dish… I confess I didn’t listen any further as that isn’t heaven for me…) and Welsh rabbit fondue, with all of the dishes no doubt sourced from only the best and most sustainable suppliers. Dinner for two with a bottle of wine was around £80, so not too cheap but cheaper than a one might expect from a restaurant with the name Mark Hix attached to it. Try this out for me, I’d love to hear everyone else’s take on Hix’s latest venture. Oh and if you need a dining companion there I’ll happily come along! Firstly, well done on getting in, that’s a bit of a score for a start. What prompted the comment was that Lolli was served bone marrow with her meal at Barbecoa on Friday and she’d not tried it before either. Your picture is almost identical to how it arrived on her plate too and she also wasn’t too keen. I had a taste and I have to confess, I didn’t go back for more. I remember my grandfather getting me to try it as a boy and it didn’t seem so bad at the time but, nah, its not really all that is it? I’m sure it will start popping up in more of these types of establishments. I felt that I really ought to try bone marrow – as everyone else is doing it. I won’t bother ordering it again, it just wasn’t very nice and I could almost feel it clinging to my arteries! 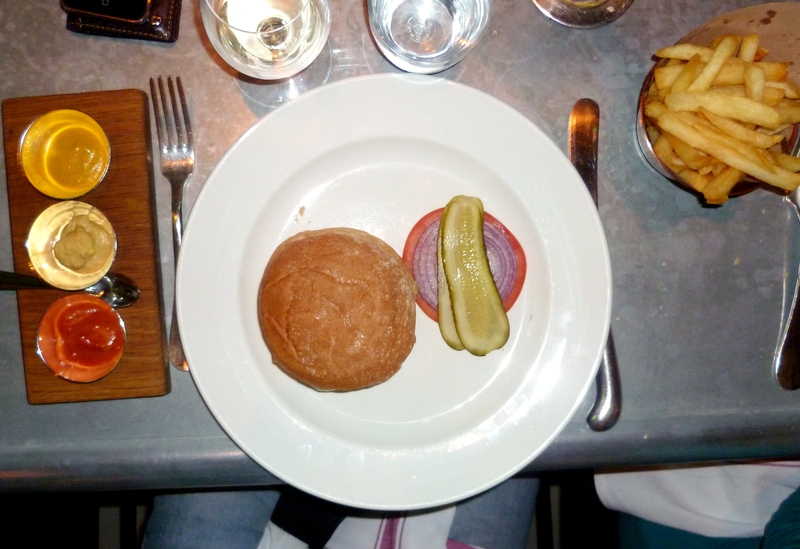 Hix is definately worth a visit though, the food is simple good old British food for the most part done well. I have been so bewierlded in the past but now it all makes sense!